Nuclear imaging refers to the technique of producing visuals of the organs of the body by administering small amounts of radioactive tracers. Globally, Demand for emerging markets industry the developing nations, Potential Applications, Technological advancements and Increasing adoption of nuclear medicine systems are the prime growth drivers of global nuclear Imaging market. In addition, emerging economies such as China, India and others, will create new opportunities for global nuclear Imaging market. However, higher cost of the research and development, and highly advanced hybrid nuclear imaging equipment are the key restraints for global nuclear Imaging market. Geographically, The U.S. is the biggest market for nuclear imaging thanks to factors such as growing coverage for PET and SPECT imaging by the Centres for Medicare and Medicaid Services (CMS), rising usage of the systems in the early detection of Alzheimer’s and cancer, improved healthcare reforms such as the Affordable Care Act, expanding health insurance and increase in healthcare expenditure. Industry analysis suggests that emerging Asian economies such as China and India, and developing South American countries such as Brazil and Peru possess high potential for growth due to growing geriatric population, widespread increase in chronic diseases, rising incomes and medical expenditure, and increased healthcare infrastructure. This report identifies the nuclear Imaging market size in for the year 2016-2021, and forecast of the same for year 2021. 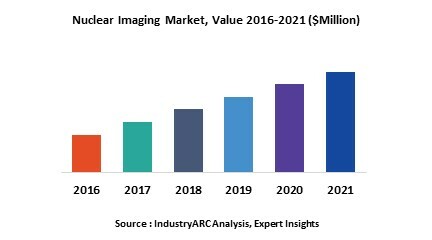 It also highlights the potential growth opportunities in the coming years, while also reviewing the market drivers, restraints, growth indicators, challenges, market dynamics, competitive landscape, and other key aspects with respect to Nuclear Imaging market.